The following tips can be helpful in reaching and maintaining your ideal body weight. The specific issues that women face, like a higher susceptibility to osteoporosis make health and fitness of particular interest to them. Imagine what the world would be like if no one exercised. Never mind, you can already see it when you walk down nearly any city street. We all know that exercise is essential to living a healthy lifestyle. It’s the best way to lose body fat, because exercise boosts the metabolism and encourages the body to burn excess calories. Physical exercise revs up your heart and gets your lungs pumping at their maximum capacity. You’ll have healthier bones when you exercise, and you’ll look good and feel great about yourself. Exercise gives you increased stamina, making it easier for you to keep up with life’s busy pace. The unfortunate reality is that, although nearly everyone is aware of the many benefits of fitness, many women ignore the facts and choose to do nothing. It’s too easy to press the snooze button, take the elevator or drive to work. In our society of convenience, people are suffering with a lack of health and fitness. 1. You don’t have to be Superwoman. Don’t fret if you feel as though you’re not doing enough. Women often have the innate feeling that they’re letting someone down. Don’t worry if you’re not able to spend ten hours a week at the gym or go for a run every morning. All that really matters is that you can commit to improving your health and fitness, and stick to a program. Professionals advise working out three to five times a week in 20-60 minute sessions, but our busy schedules don’t always allow this. You can easily become frustrated if you can’t meet someone else’s ideal. Working out twice a week at twenty minutes per session will put you on the right track. 2. Focus on your successes. Concentrate on how good you feel about your new health and fitness regime. If weight loss is part of your plan, and you’re struggling to meet your goal, don’t beat yourself up about it. Focus on what you’ve done to this point, and use today as a new starting point. You’ve made a commitment to yourself, and that is your biggest success. Many women begin their health and fitness routines with cardio exercises, and then follow it up with weight lifting. The disadvantage is that you may be missing out on a critical component of the routine, because you’re spending all of your time with cardio. If this is a regular occurrence, the outcome can be disappointing despite countless hours at the gym. Reverse the order and perform weight training first. You’ll likely see a more positive visible outcome. The average women’s health and fitness regime requires a workout of no more than an hour at a time. Spending too much time at the gym or doing the same exercises over extended periods can become tedious and boring. By focusing on the exercises and narrowing your time frame, your workout sessions will be more fun and more efficient. Women should work out at 75-85% of their maximum heart rate. When your heart rate is too low, it’s a sign that you’re not working to your full potential. Too high a rate, on the other hand, shows that you’re pushing yourself to a potentially dangerous level. Sticking with a happy medium of 50% or so will not help you to realize your fitness goals. Keep a heart rate monitor on hand or do a manual count incrementally during your workout to ensure that you’re reaching, but not exceeding, your ideal target heart rate. It’s important to be involved in some sort of fitness social support web. If you are currently in a regime with no fitness community, you may find that your workouts are lacking or not that successful. A social support can bring a greater sense of camaraderie, kinship and even healthy competition. If you normally workout alone at home, try visiting a gym for a sample workout, or joining a yoga, Pilates or sailing class. Running clubs and golf courses are other ways to keep in shape and meet new people. It’s tough to take on a new health and fitness routine. You need to have commitment and discipline, and you need to be prepared to work hard. Give yourself a pep talk. Don’t pressure yourself too much. You deserve a pat on the back, so go ahead and give yourself one. Others give you great feedback, so why not you? Women’s health and fitness has become a bigger issue than ever before. Fast food and sedentary lifestyles are robbing women of their good health and stripping them of their self-esteem. The demise of JDub has sparked an important conversation about very real threats to a sustainable culture of creativity and innovation in the Jewish world. We have heard concerns about broken business models for Jewish not-for profits, the narrow market for Jewish creativity and media, and a call for much broader and deeper support from the philanthropic sector. However, what’s missing from the conversation is a story we are telling at the 14th Street Y – hopefully as a model for others seeking a long-term solution for engaging Jewish innovation. The story begins more than a century ago, as billions of dollars of capital came to be invested in the Jewish communal infrastructure. The results of this investment are the core businesses of Jewish life as we have known it until today – JCCs and schools, synagogues and hospitals, museums and libraries, universities and university-based programs, senior centers, camps, and much more. While the community at large struggles with solutions for how to maintain a relevant mission and a funding base for the operating and capital expenses required by this traditional programmatic real estate, the Jewish innovation sector struggles to find physical space for its work, the resources to pay its bills, and, perhaps most importantly, a match between its ambitious and diverse missions and the needs and interests of the wider community. In 2008, as the 14th Street Y began structuring a vision for future, we established LABA: The National Laboratory for New Jewish Culture as internal project, introducing scores of artists and culture makers to the Y as a hub for innovation and connection in the realms that matter to them. Then we began housing the core team of Storahtelling, a vibrant relationship that has continued for several years. We now host a BBYO regional office as well. We reimaged the equities of our basic operations, including the physical plant and our programs base, mixing established innovators from the creative class with our own ideas and skills. In three years, our operating budget as a whole had grown by more than 30% (or $2mil). Innovation is good for the bottom line of core institutions like ours. It’s good for innovators who need the space, budget relief, audiences and colleagues, and Jewish intellectual stimulation not offered elsewhere, too. Furthermore, our JCC clientele wants its core services to be impacted by innovation, culture makers, and the arts. In fact, we often embed artists in core programs (as teachers, designers, master artists, senior technical advisers and other creative service providers) and pay them at market rates or better for their efforts. This is a deeply satisfying system in which all of its participants are stakeholders meeting their own needs. Despite its challenges, Jewish communal life remains an ecosystem of tremendous size and equity. I agree with my colleagues that the innovation ecosystem must strive for better business models and that the funding streams within this system should flow more generously. Yet, of all the efforts that might be undertaken to support a loosely affiliated network of innovative, culture changing organizations without whom Jewish communal culture lacks relevance, color, and depth, perhaps the most critical is converting the vast terrain of the Jewish infrastructure into a garden where they can grow. New Jewish Culture should be the force transforming the essence of the infrastructure we have already built. Dr. Stephen Hazan Arnoff is the Executive Director of the 14th Street Y in New York City. As a workingmomaholic I have not written very much lately about the workouts I’ve been attempting to add to my life. I love summertime as a rule, and I always want to work out more during the warmer months. This summer, the Y added Definitions, a Friday 9:30AM class that I absolutely love for several reasons. First, instructor Shana Brady is as insanely sweet as she is knowledgeable about everything she does. She’s one of the Y’s best personal trainers, and gently encourages us through a series of exercises that are surprisingly difficult, and also different from any class I’ve ever taken. Shana’s class is based on functional training, which means that everything you do to increase your muscle mass and endurance is also a movement that you might use in real life. Pretty cool, right? The other reason I love this class is because I get to work out with many of the people who come to the Y on a regular basis. Have I mentioned that we’ve got a really great community here at the Y? We really do. We get everyone at this particular class from basketball players (female…haven’t seen the guys get up this early yet) Y Staff (Becky Skoff, LABA Manager has been seen in the fitness studio a few times) Seniors (one woman in particular stopped me to tell me how great this class was) and some supermoms looking to shake up their traditional gym workouts. I hope you’ll join us! Definitions runs every Friday morning at 9:30AM in the fitness studio; instructed by Shana Brady. The 14th Street Y will be the place to be this Sunday evening! JDUB Records will hold its last event on our rooftop this Sunday, July 17th. We’re sorry to hear that this unique record label will be folding, but excited that they’ll be partying on our rooftop. For the complete story, click on the link below! By the way…JDUB will be providing one of their fabulous DJ’s for our September 18th OPENgreenHouse. Have you ever seen a cool DJ jam with solar generated music? It’s just one of the many things planned for this exciting Autumn celebration. Thanks, JDUB! 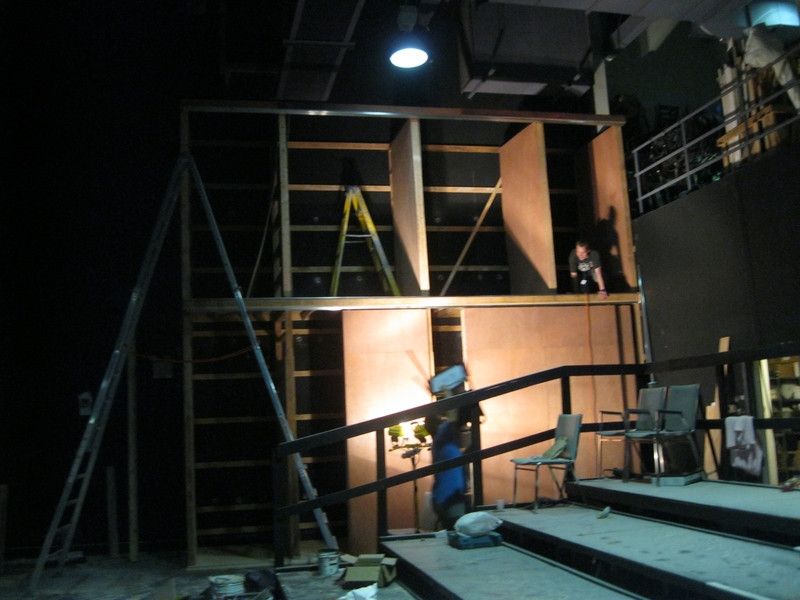 The 14th Street Y Theater is dark for a few weeks while we make some improvements to the newly renovated space. Last week ended in a bang as Epic Theatre, Vicious Bear, and Solar One joined together to present a theater festival called The Sunshine Series. The Sunshine series was presented as a week of socially minded theater, featuring a workshop of the show WATER. The 14th Street Y was honored to participate in this very cool project last spring with a gallery show inspired by water stories from our own community. Below is an interview with one of the producers of the Sunshine Series, Zak Berkman, the Founding Executive Director of Artistic Programming. What is the Sunshine Series? All of us Epic are thrilled to be at the 14th Street Y for our seventh annual Sunshine Series. It’s a very fitting home to be presenting these five vital new pieces of theatre in various stages of development, each yearning to tell an important story about our time and to live in conversation with a diverse, multi-generational audience. This is Epic’s annual festival nurturing new political writing – plays that are topical or timeless, and seek to engage and activate us in specific ways. 2. How did Epic and the Water Project get together? Friendships in many directions. Epic worked with Daniella and most of the WATER design team on Judith Thompson’s PALACE OF THE END and have been looking to collaborate again. Epic’s very excited by cross-sector partnerships existing at the heart of new play development and what Vicious Bear and the WATER teams has initiated with Solar One is something we want to support and learn from. 3. How does the Festival work? The first week featured readings of four new plays; the second week was dedicated to the workshop of WATER. What does “socially minded theater” mean? Theatre with a purpose to engage everyone involved in a vibrant conversation about a vital issue challenging our civic life. How can Learn more about the Sunshine Series?